American Atheists are opposing a cross-shaped structure at the Ground Zero memorial in New York. Rev. Brian Jordan sprinkles water on the Ground Zero cross during a ceremony in July. American Atheists has filed a lawsuit asking for its removal. THE FACEBOOK PAGE belonging to FOX News has been bombarded with threatening messages after an atheist was interviewed on the network. Business Insider reports that Blair Scott, the communications director for American Atheists, appeared on FOX News to discuss a lawsuit his group is taking. 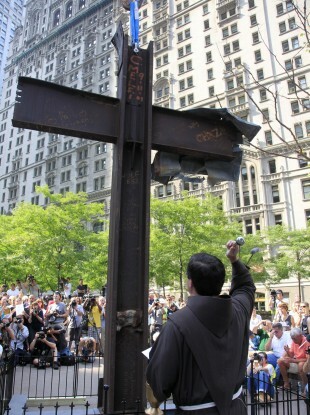 The groups wants a judge to order the removal of a cross which has been erected at Ground Zero in New York. According to The Guardian the cross is part of a beam found amid the wreckage and that it was blessed by a Catholic Priest. American Atheists feel that the “sole representation” of the Christian faith at the memorial is inappropriate. They’re calling for a “religion-neutral” monument. Following the interview, the FOX News Facebook page was reportedly targeted with more than 8,000 death threats against atheists, however the network has said that the number of messages was much lower. The Los Angeles Times reports that Daily Show presented Jon Stewart, not known for his love of FOX News, has criticised American Atheists for their opposition to the cross. He’s asked them why they care and that it should be viewed as an artifact and a “symbol of comfort”. FOX News has commented on this issue, and others, pointing to the difficulty in managing online comments. The network has said that it received a hateful comments after Blair Scott appeared on America Live, reports The Cutline. FOX News said that 200 threatening comments – a much more conservative number than the initially reported 8,000 – were identified, and that the Facebook post was subsequently deleted. Comments on FOX News’ Fox Nation website were closed on a piece referring to President Barack Obama’s 50th birthday party as a ‘Hip-Hop BBQ’ as many of them were racist in tone. Email “FOX News Facebook page hit with threats after atheist interview”. Feedback on “FOX News Facebook page hit with threats after atheist interview”.